I’m a theatre actor, but in the last 10 years people have given me parts in movies. I’ve taken them to get the money – and then I immediately forget what film it is. It’s all very nice, but it’s like water throwing over you. It’s all work to me. Was it effortless to ease back into the role of Hogwarts headmaster, Albus Dumbledore? Well, I don’t have to play anyone really. I just stick on a beard and play me, so it’s no great feat. I never ease into a role – every part I play is just a variant of my own personality. I’m not really a character actor at all. 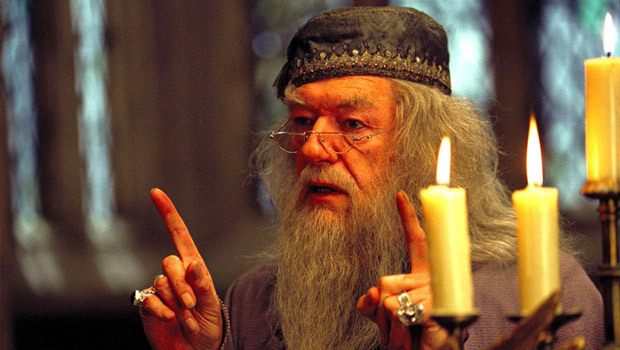 What makes Dumbledore the greatest wizard of all time? I have no idea. I just say what the script tells me to say. I learn the lines and say them – I don’t have much sub-text. There’s no sub-text in Harry Potter really, it’s all magic. Anything can happen. Do you get on with the child actors in the film? Yes, I do. The kids are remarkable – and I’m not saying that because I’m in the bloody film. Daniel is so cool and with it and on the ball. He seems unfazed by anything. The great luck was to get that boy. Do children approach you as Dumbledore in the street, or are you free once the fake beard is off? Can you tell us about one of your practical jokes? On my first Potter film, the director and I shoved a fart machine in Harry Potter’s sleeping bag. He had his eye on one of the extra girls and asked, “Can she be in the next sleeping bag to me in this scene?” She was a beautiful girl playing a non-speaking part so we agreed. I had the controller, and as soon as he wakes up in the Great Hall, I pressed the button. It destroyed his credibility with her. Did you get the idea to use a fart machine from Johnny Depp? He’s used them on sets before, hasn’t he? Johnny’s constantly using fart machines – but this one wasn’t one of his. I bought this one. Have you played any gags on Depp? My best joke on Johnny Depp was when we were filming inside this stately home in England. It’s the only place where the Queen can ride her horse from Windsor without going on public roads.